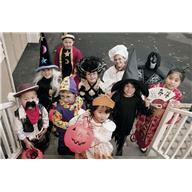 Halloween generates much discussion among Christians. Should we ‘celebrate’ Halloween like everyone else by allowing our children to go door-to-door, provide an alternative at church (trunk or treat or All Hallows Eve) or abstain completely? Here are some articles from each of the different positions. The Resurgence article is the best place to start for an overview of the issue and Hank Hanegraff’s is short, and well written. This entry was posted in Discipleship, Holidays and tagged Christian view of Halloween, Should Christians participate in Halloween. Bookmark the permalink.